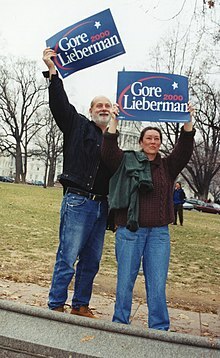 For the election of George W. Bush against Al Gore, see 2000 United States presidential election. George W. Bush and Richard Cheney, Petitioners v. Albert Gore, Jr. and Joseph Lieberman, et al. Judgment for defendant, Fla. Cir. Ct.; matter certified to Florida Supreme Court, Fla. Ct. App. ; aff'd in part, rev'd in part, sub nom. Palm Beach County Canvassing Bd. v. Harris, 772 So. 2d 1273 (2000); cert. granted, stay granted, 531 U.S. 1036 (2000). In the circumstances of this case, any manual recount of votes seeking to meet the December 12 "safe harbor" deadline would be unconstitutional under the Equal Protection Clause of the Fourteenth Amendment. Florida Supreme Court reversed and remanded. In a per curiam decision, the Court ruled that the use of different standards of counting in different counties violated the Equal Protection Clause, and ruled that no alternative method could be established within the time limit set by Title 3 of the United States Code (3 U.S.C. ), § 5 ("Determination of controversy as to appointment of electors"), which was December 12. The vote regarding the Equal Protection Clause was 7–2, and regarding the lack of an alternative method was 5–4. Three concurring justices also asserted that the Florida Supreme Court had violated Article II, § 1, cl. 2 of the Constitution, by misinterpreting Florida election law that had been enacted by the Florida Legislature. In the United States, each state conducts its own popular vote election for President and Vice President. The voters are actually voting for a slate of electors, each of whom pledges to vote for a particular candidate for each office, in the Electoral College. Article II, § 1, cl. 2 of the U.S. Constitution provides that each state legislature decides how electors are chosen. Early in U.S. history, most state legislatures directly appointed the slate of electors for each of their respective states. Today, state legislatures have enacted laws to provide for the selection of electors by popular vote within each state. While these laws vary, most states, including Florida, award all electoral votes to the candidate for either office who receives a plurality of the state's popular vote. Any candidate who receives an absolute majority of all electoral votes nationally (270 since 1963) wins the Presidential or Vice Presidential election. On November 8, 2000, the Florida Division of Elections reported that Bush won with 48.8% of the vote in Florida, a margin of victory of 1,784 votes. The margin of victory was less than 0.5% of the votes cast, so a statutorily-mandated automatic machine recount occurred. On November 10, with the machine recount finished in all but one county, Bush's margin of victory had decreased to 327. According to legal analyst Jeffrey Toobin, later analysis showed that a total of 18 counties—accounting for a quarter of all votes cast in Florida—did not carry out the legally mandated machine recount, but "[n]o one from the Gore campaign ever challenged" the notion that the machine recount had been completed. Florida's election laws allow a candidate to request a county to conduct a manual recount, and Gore requested manual recounts in four Florida counties: Volusia, Palm Beach, Broward and Miami-Dade, which are counties that traditionally vote Democratic and would be expected to garner more votes for Gore. Gore did not, however, request any recounts in counties that traditionally vote Republican. The four counties granted the request and began manual recounts. However, Florida law also required all counties to certify their election returns to the Florida Secretary of State within seven days of the election, and several of the counties conducting manual recounts did not believe they could meet this deadline. On November 14, the statutory deadline, the Florida Circuit Court ruled that the seven-day deadline was mandatory, but that the counties could amend their returns at a later date. The court also ruled that the Secretary, after "considering all attendant facts and circumstances," had discretion to include any late amended returns in the statewide certification. Before the 5 pm deadline on November 14, Volusia County completed its manual recount and certified its results. At 5 pm on November 14, Florida Secretary of State Katherine Harris announced that she had received the certified returns from all 67 counties, while Palm Beach, Broward, and Miami-Dade counties were still conducting manual recounts. Harris issued a set of criteria by which she would determine whether to allow late filings, and she required any county seeking to make a late filing to submit to her, by 2 pm the following day, a written statement of the facts and circumstances justifying the late filing. Four counties submitted statements, and after reviewing the submissions Harris determined that none justified an extension of the filing deadline. She further announced that after she received the certified returns of the overseas absentee ballots from each county, she would certify the results of the presidential election on Saturday, November 18, 2000. However, on November 17, the Florida Supreme Court enjoined Harris from certifying the election while it heard appeals from the various cases in progress. On November 21, it allowed the manual recounts that had been started to continue and delayed certification until November 26. Counting every legally cast vote cannot constitute irreparable harm [...] Preventing the recount from being completed will inevitably cast a cloud on the legitimacy of the election. The oral argument in Bush v. Gore occurred on December 11. Theodore Olson, a Washington, D.C. lawyer and future Solicitor General, delivered Bush's oral argument. 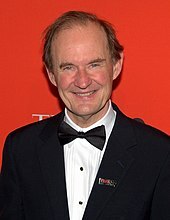 New York lawyer David Boies argued for Gore. During the brief period when the U.S. Supreme Court was deliberating on Bush v. Gore, the Florida Supreme Court provided clarifications that the U.S. Supreme Court had requested on December 4 in the case of Bush v. Palm Beach County Canvassing Board. Because of the extraordinary nature and argued urgency of the case, the U.S. Supreme Court issued its opinion in Bush v. Gore on December 12, 2000, less than a day after hearing oral argument. This clause arguably gives power to only one branch of Florida's state government (i.e., the state legislature). If any State shall have provided [...] for its final determination of [...] the appointment of all or any of the electors of such State [...] at least six days before the time fixed for the meeting of the electors, such determination [...] shall be conclusive. Were the recounts, as they were being conducted, constitutional? If the recounts were unconstitutional, what is the remedy? Bush argued that recounts in Florida violated the Equal Protection Clause of the Fourteenth Amendment, because Florida did not have a statewide vote recount standard. Each county was on its own to determine whether a given ballot was an acceptable one. Two voters could have marked their ballots in an identical manner, but the ballot in one county would be counted while the ballot in a different county would be rejected, due to the conflicting manual recount standards. Gore argued that there was indeed a statewide standard, the "intent of the voter" standard, and that this standard was sufficient under the Equal Protection Clause. Furthermore, Gore argued that the consequence of ruling the Florida recount unconstitutional simply because it treated different voters differently would effectively render every state election unconstitutional and that each method has a different rate of error in counting votes. A voter in a "punch-card" county has a greater chance of having his vote undercounted than a voter in an "optical scanner" county. If Bush wins, Gore argued, every state would have to have one statewide method of recording votes to be constitutional. This was the most closely decided issue in the case. The arguments presented by counsel did not extensively address what the Court should do if the Court were to find an Equal Protection violation. However, Gore did argue briefly that the appropriate remedy would not be to cancel all recounts, but rather would be to order a proper recount. Bush also argued that the Florida Supreme Court's ruling violated Article II, § 1, cl. 2 of the U.S. Constitution. Essentially, Bush argued that the Florida Supreme Court's interpretation of Florida law was so erroneous that its ruling had the effect of making new law. Since this "new law" had not been directed by the Florida legislature, it violated Article II. Bush argued that Article II gives the federal judiciary the power to interpret state election law in presidential elections to ensure that the intent of the state legislature is followed. Gore argued that Article II presupposes judicial review and interpretation of state statutes, and that the Florida Supreme Court did nothing more than exercise the routine principles of statutory construction to reach its decision. Seven justices (the five Justice majority plus Souter and Breyer) agreed that there was an Equal Protection Clause violation in using different standards of counting in different counties. Five justices agreed that December 12 (the date of the decision) was the deadline Florida had established for recounts (Rehnquist, O'Connor, Scalia, Kennedy, and Thomas in support; Stevens, Souter, Ginsburg, and Breyer opposed). Justices Souter and Breyer wanted to remand the case to the Florida Supreme Court to permit that court to establish uniform standards of what constituted a legal vote and then manually recount all ballots using those standards. Three justices (Rehnquist, Scalia and Thomas) argued that the Florida Supreme Court had acted contrary to the intent of the Florida legislature. Four justices (Stevens, Souter, Ginsburg and Breyer) specifically disputed this in their dissenting opinions, and the remaining two Justices (O'Connor and Kennedy) declined to join Rehnquist's concurrence on the matter. The Supreme Court, in a per curiam opinion, ruled that the Florida Supreme Court's decision, calling for a statewide recount, violated the Equal Protection Clause of the Fourteenth Amendment. This ruling was by a 7–2 vote. The Court held that the Equal Protection Clause guarantees to individuals that their ballots cannot be devalued by "later arbitrary and disparate treatment". Even if the recount was fair in theory, it was unfair in practice. The record, as weighed by the Florida Supreme Court, suggested that different standards were seemingly applied to the recount from ballot to ballot, precinct to precinct, and county to county, even when identical types of ballots and machines were used. According to the Court, the statewide standard (that a "legal vote" is "one in which there is a 'clear indication of the intent of the voter'") could not guarantee that each county would count the votes in a constitutionally permissible fashion. The Court stated that the per curiam opinion's applicability was "limited to the present circumstances, for the problem of equal protection in election processes generally presents many complexities." The Court ruled 5–4 that no constitutionally valid recount could be completed by a December 12 "safe harbor" deadline. The Court asserted that "the Supreme Court of Florida has said that the legislature intended the State's electors to 'participat[e] fully in the federal electoral process,' as provided in 3 U.S.C. § 5." The Court therefore effectively ended the proposed recount, because "the Florida Legislature intended to obtain the safe-harbor benefits of 3 U.S.C. §5." Four justices (Justices Stevens, Ginsburg, Souter and Breyer) dissented as to stopping the recount. Two of these, Breyer and Souter, acknowledged that the counting up until December 9 had not conformed with Equal Protection requirements. However, Souter and Breyer favored remanding the case back to the Florida Supreme Court for the purpose of crafting specific guidelines for how to count disputed ballots, in contrast to the majority's decision to halt the recount altogether. The actual counting had ended with the December 9 injunction issued by the same five-justice majority, three days before any deadline. The per curiam opinion in Bush v. Gore did not technically dismiss the case, and instead "remanded for further proceedings not inconsistent with this opinion." Gore's attorneys therefore understood that they could fight on, and could petition the Florida Supreme Court to repudiate the notion that December 12 was final under Florida law. However, Gore dropped the case, reportedly because he was not optimistic about how the Florida justices would react to further arguments and, as one of his advisers put it, "the best Gore could hope for was a slate of disputed electors." In addition, Gore campaign chairman Bill Daley argued that fighting on was futile because even if the Florida Supreme Court defied the U.S. Supreme Court and ordered a new recount, "[t]he GOP would take them straight back to Washington, where the [U.S.] Supreme Court would repeat: 'You ain't going to count, okay? So quit bothering us.'" On remand, the Florida Supreme Court issued an opinion on December 22, 2000, that did not dispute whether December 12 was the deadline for recounts under state law, although this was disputed in a concurring opinion by Florida Supreme Court Justice Leander Shaw who nevertheless expressed deference to the U.S. Supreme Court's view on this issue and who also argued that, in any case, the Florida Supreme Court would (in his opinion) be unable to craft a remedy which would satisfy all of the U.S. Supreme Court's equal protection, due process, and other concerns. The most closely decided aspect of the case was the key question of what remedy the Court should order, in view of an Equal Protection Clause violation. Gore had argued for a new recount that would pass constitutional muster, but the Court instead chose to end the election, asserting that "the Florida Supreme Court has said that the Florida Legislature intended to obtain the safe-harbor benefits of 3 U.S. C. §5." This assertion in Bush v. Gore has proven very controversial. What is a reasonable time required for completion will, in part, depend on whether the election is for a statewide office, for a federal office or for presidential electors. In the case of the presidential election, the determination of reasonableness must be circumscribed by the provisions of 3 U.S.C. § 5, which sets December 12, 2000, as the date for final determination of any state's dispute concerning its electors for that determination to be given conclusive effect in Congress ... As always, it is necessary to read all provisions of the elections code in pari materia. In this case, that comprehensive reading required that there be time for an elections contest pursuant to section 102.168, which all parties had agreed was a necessary component of the statutory scheme and to accommodate the outside deadline set forth in 3 U.S.C. § 5 of December 12, 2000. However, according to Nelson Lund, a former official of the first Bush administration, one might argue that the Florida Supreme Court was discussing the "protest provisions of the Florida Election Code, whereas the issues in Bush v. Gore arose under the contest provisions." Likewise, Peter Berkowitz has written that, "Perhaps it would have been more generous for the Court to have asked the Florida court on remand whether 'outside deadline' referred to contest-period as well as protest-period recounts." Abner Greene has pointed to evidence that "the Florida Supreme Court thought all manual recounts – whether protest or contest – must be completed no later than December 12." Nevertheless, Greene concluded that, "lack of clarity about the Florida Supreme Court's views on the safe-harbor provision should have resulted in a remand to that court for clarification," in addition to the remand of December 4. The Court in Bush v. Gore did remand the case instead of dismissing it, but the remand did not include another request for clarification. Louise Weinberg argues that, even giving the Court the benefit of the doubt that it acted appropriately in intervening in Florida state law, its actions should be deemed unconstitutional because its intervention was not coupled with any kind of remedy aimed at determining the actual outcome of the election. Some critics of the decision argue that the majority seemed to seek refuge from their own logic in the following sentence in the majority opinion: "Our consideration is limited to the present circumstances, for the problem of equal protection in election processes generally presents many complexities." The Court's defenders argued that this was a reasonable precaution against the possibility that the decision might be read over-broadly, arguing that in the short time available it would not be appropriate to attempt to craft language spelling out in greater detail how to apply the holding to other cases. Critics, however, interpreted the sentence as stating that the case did not set precedent in any way and could not be used to justify any future court decision, and some suggested that this was evidence the majority realized its holding was untenable. Regardless of whether the majority intended the decision to be precedential, it has been cited by several federal courts in election cases. Not only is that claim inconsistent with the position of Justices Breyer and Souter, it is inconsistent with the position of three of the Florida justices who dissented. No Justice on the Florida Supreme Court was a Republican appointee, but three of them concluded that the recount that Vice President Gore wanted was unconstitutional. Three of the seven Florida Supreme Court justices also found an Equal Protection violation when the manual ballot-counters used different procedures to examine identical ballots and count them differently. On the eve of the election Sandra Day O'Connor had made a public statement that a Gore victory would be a personal disaster for her. Clarence Thomas's wife was so intimately involved in the Bush campaign that she was helping to draw up a list of Bush appointees more or less at the same time as her husband was adjudicating on whether the same man would become the next President. Finally, Antonin Scalia's son was working for the firm appointed by Bush to argue his case before the Supreme Court, the head of which was subsequently appointed as Solicitor-General. In 2001, a consortium of news organizations, assisted by professional statisticians (NORC), examined numerous hypothetical ways of recounting all the Florida ballots. The study was conducted over a period of 10 months. The consortium examined 175,010 ballots that vote-counting machines had rejected. In each alternative way of recounting the rejected ballots, the number of additional votes for Gore was smaller than the 537-vote lead that state election officials ultimately awarded Bush. Under the strategy that Al Gore pursued at the beginning of the Florida recount — filing suit to force hand recounts in four predominantly Democratic counties — Bush would have kept his lead, according to the ballot review conducted by the consortium. Likewise, if Florida's 67 counties had carried out the hand recount of disputed ballots ordered by the Florida Supreme Court on December 8, applying the standards that election officials said they would have used, Bush would have emerged the victor by 493 votes. On the other hand, the study also found that if the official vote-counting standards had not rejected ballots containing overvotes (where a voter selects more than one candidate in a race where each voter may only choose one candidate) a statewide tally would have resulted in Gore emerging as the victor by 60 to 171 votes. These tallies conducted by the NORC consortium are caveated with the statement: "But no study of this type can accurately recreate Election Day 2000 or predict what might have emerged from individual battles over more than 6 million votes in Florida's 67 counties." The subsequent analysis revealed that black-majority precincts had three times as many rejected ballots as white precincts. "For minorities, the ballot survey found, a recount would not have redressed the inequities because most ballots were beyond retrieving. But a recount could have restored the votes of thousands of older voters whose dimpled and double-voted ballots were indecipherable to machines but would have been clear in a ballot-by-ballot review." The ballot review later conducted by a consortium of news organizations did not have access to these decisive ballots, which in many cases had disappeared and could not be produced. Part of the reason recounts could not be completed was the various stoppages ordered by the various branches and levels of the judiciary, most notably the Supreme Court itself. Opponents argued that it was improper for the Court (by the same five Justices who joined the per curiam opinion) to grant a stay that preliminarily stopped the recounts based on Bush's likelihood of success on the merits and the possible of irreparable injury to Bush. Although stay orders normally do not include justification, Scalia concurred to express some brief reasoning to justify it, saying that one potential irreparable harm was that an invalid recount might undermine the legitimacy of Bush's election (presumably if, for example, it were to find that Gore should have won). Supporters of the stay, such as Charles Fried, contend that the validity of the stay was vindicated by the ultimate decision on the merits and that the only thing that the stay prevented was a recount "being done in an unconstitutional way." The dissent of Justice Stevens was criticized by George Mason University School of Law Professor and former Associate White House Counsel to the George H. W. Bush administration Nelson Lund. Lund said: "[t]he best known passage, which comes from Justice Stevens' dissent, consists of a rhetorical flourish rather than analysis." 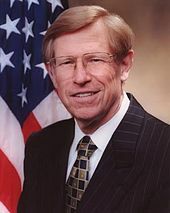 In that passage, Stevens had criticized the Court for questioning the impartiality of Florida's judiciary. ^ a b c Bush v. Palm Beach County Canvassing Board, 531 U.S. 70 (2000). ^ "Bush v. Gore". Oyez Project. Retrieved January 22, 2011. "Noting that the Equal Protection clause guarantees individuals that their ballots cannot be devalued by 'later arbitrary and disparate treatment,' the per curiam opinion held 7–2 that the Florida Supreme Court's scheme for recounting ballots was unconstitutional." ^ a b c d e Palm Beach County Canvassing Bd. v. Harris, 772 So.2d 1220 (November 21, 2000). Late-filing criteria are at note 5. See The American Presidency Project for other documents related to the 2000 election dispute. ^ "Election 2000 Timeline". PG Publishing Co., Inc. December 17, 2000. Retrieved October 28, 2006. ^ Toobin, Jeffrey. "Too Close to Call". Random House, 2002, p. 66. ^ "Leon County Judge Rules on Certification" (PDF). Retrieved October 28, 2006. ^ "Text: Florida Recount Results". Retrieved October 28, 2006. ^ For example, the concurring opinion in Bush v. Gore cited the December 6, 2000, decision in Touchston v. McDermott, 234 F.3d 1130 Archived December 9, 2008, at the Wayback Machine (11th Cir. 2000). ^ Gore v. Harris, 772 S2d 1243 (December 8, 2000). Bush v. Gore on Application for Stay. ^ Transcript and audio of oral arguments in Bush v. Gore, via Oyez.org. Retrieved 2008-06-05. ^ a b Palm Beach County Canvassing Board v. Harris, 772 S2d 1273 Archived June 25, 2008, at the Wayback Machine (Fla December 11, 2000). ^ Gillman, Howard. The Votes That Counted: How the Court Decided the 2000 Presidential Election. pages 81–82 (University of Chicago Press, 2003). ^ "US CODE: Title 3,5. Determination of controversy as to appointment of electors". The quote is the title of Section 5, Title 3. ^ "US CODE: Title 3,5. Determination of controversy as to appointment of electors". ^ Id. "Seven Justices of the Court agree that there are constitutional problems with the recount ordered by the Florida Supreme Court that demand a remedy." Last paragraph in Part II. ^ Id. "The only disagreement is as to the remedy." Last paragraph in Part II. ^ a b "Scalia and Stevens clash over recount stay in Bush v. Gore". CNN. December 11, 2000. Archived from the original on May 8, 2009. Retrieved April 27, 2010. ^ "Bush v. Gore, Brief for Petitioners" (PDF). "The Equal Protection Clause prohibits government officials from implementing an electoral system that gives the votes of similarly situated voters different effect based on the happenstance of the county or district in which those voters live." Paragraph 2 in Argument, Part III-A. ^ "Bush v. Gore, Brief of Respondent" (PDF). "The court below was quite insistent that the counting of ballots must be governed by a single uniform standard: the intent of the voter must control." Paragraph 3 in Argument, Part III-A. ^ Id. "... if petitioners mean to say that all votes must be tabulated under a fixed and mechanical standard (e.g., the "two-corner chad rule"), their approach would render unconstitutional the laws of States that hinge the meaning of the ballot on the intent of the voter ..." Paragraph 3 in Argument, Part III-A. ^ "Bush v. Gore, Brief of Respondent" (PDF). "[T]he appropriate remedy for either an Equal Protection Clause or Due Process Clause violation would not be to cancel all recounts, but rather to order that the recounts be undertaken under a uniform standard." Footnote 28. ^ "Bush v. Gore, Brief for Petitioners" (PDF). "By rewriting that statutory scheme—thus arrogating to itself the power to decide the manner in which Florida's electors are chosen—the Florida Supreme Court substituted its judgment for that of the legislature in violation of Article II. Such a usurpation of constitutionally delegated power defies the Framers' plan." Paragraph 2 in Argument, Part I. ^ "Bush v. Gore, Brief of Respondent" (PDF). "Even apart from the absurd theory that McPherson requires everything relevant to a state's process for choosing electors to be packed into a specialized presidential electoral code, the very premise of petitioner's argument is fatally flawed because the Florida Legislature re-enacted the contest statute in 1999 against the settled background rule that decisions of circuit courts in contest actions are subject to appellate review." Paragraph 5 in Argument, Part I. ^ "Bush v. Gore, Concurrence, Rehnquist". ^ "Bush v. Gore, Dissent, Breyer". ^ "Bush v. Gore, Dissent, Souter". ^ "Bush v. Gore, US Supreme Court Opinion". Id. 5th paragraph in Part I. ^ Toobin, Jeffrey (2007). The Nine: Inside the Secret World of the Supreme Court , pp. 184, (Doubleday, New York, NY). ^ "Bush v. Gore, Dissent, Stevens". ^ a b Political Staff of the Washington Post, Deadlock: The Inside Story of America's Closest Election, pages 230–234 (Public Affairs 2001). Via Google Books. ^ Von, David (February 3, 2001). "Anxious Moments In the Final Stretch". The Washington Post. Retrieved April 21, 2017. ^ Gore v. Harris, 773 So. 2d 524 Archived June 25, 2008, at the Wayback Machine (December 22, 2000). Only Florida Supreme Court Justice Leander Shaw, in a concurring opinion, disputed that December 12 was the deadline for recounts under state law. Justice Shaw had joined the dissenting opinion in Gore v. Harris before the ruling in Bush v. Gore. ^ McConnell, Michael. "Two-And-A-Half Cheers for Bush v. Gore" in The Vote: Bush, Gore, and the Supreme Court, page 118 (University of Chicago Press, Cass Sunstein and Richard Epstein Eds. 2001). Via Google Books. ^ a b "Bush's Team: The First Choices". The New York Times. January 23, 1989. p. A00020. ^ Lund, Nelson. "The Unbearable Rightness of Bush v. Gore" in The Longest Night: Polemics and Perspectives on Election 2000, page 176 (University of California Press, Arthur Jacobson and Michel Rosenfeld, eds. 2002). ^ Berkowitz, Peter and Wittes, Benjamin. "The Lawfulness of the Election Decision: A Reply to Professor Tribe", Villanova Law Review, Vol. 49, No. 3, 2004. ^ a b Greene, Abner. "Is There a First Amendment Defense for Bush v. Gore? ", 80 Notre Dame L. Rev. 1643 (2005). Greene points to footnotes 21 and 22 in Gore v. Harris, 772 S2d 1243 (December 8, 2000), as evidence that the Florida Supreme Court thought all recounts had to be completed by December 12, 2008. ^ Weinberg, Louise. in When Courts Decide Elections: The Constitutionality of Bush v. Gore, 82 Boston University Law Review 609 (2002), p. 33. In Bush v. Gore, on the contrary, the Court actively prevented the completion of a halted state recount, never having ruled on the merits either of the challenge or the election and never having adjudicated the validity of Bush's certification or Gore's request for a recount. Instead, the Court selected the next President of the United States in the absence of a completed election—the ultimate political act. A meaningful remand in Bush v. Gore, or completing the election under the Court's own supervision, would have preserved the Constitution from this assault. ^ Fliter, John. "Review of The Rehnquist Court: Judicial Activism on the Right". Archived from the original on May 16, 2006. ^ a b Charles L. Zelden, Bush v. Gore: Exposing the Hidden Crisis of American Democracy (Lawrence: University Press of Kansas, 2008) ISBN 0-7006-1593-8. ^ "Bush v. Gore, US Supreme Court Opinion". (6th paragraph from end of Part II-B). ^ Lund, Nelson. "The Unbearable Rightness of Bush v. Gore" (PDF). Archived from the original (PDF) on October 17, 2005. ... it's important to remember that overly broad holdings can be worse than those that are too narrow. Broad holdings may effectively decide future cases that are factually dissimilar in ways that should be legally distinguished. ^ Spillenger, Clyde. "Supreme court fails to argue recount ruling". UCLA Today. Archived from the original on December 1, 2008. Retrieved October 28, 2006. This observation is the very antithesis of the rule of law. ^ Lemons v. Bradbury , 538 F.3d 1098 (9th Cir. 2008). ^ Stewart v. Blackwell , 444 F.3d 843 (6th Cir. 2006). ^ Bennett v. Mollis , 590 F. Supp. 2d 273 (D.R.I. 2008). ^ State ex rel. Skaggs v. Brunner , 588 F. Supp. 2d 828 (S.D. Ohio 2008). ^ ACLU v. Santillanes , 506 F. Supp. 2d 598 (D.N.M. 2007). ^ a b Dershowitz, Alan. Supreme Injustice: How the High Court Hijacked Election 2000, pages 174 and 198 (Oxford U. Press 2001). ^ Rotunda, Ronald. "Yet Another Article on Bush v. Gore", Ohio State Law Journal, Volume 64, page 283 (2003). ^ Neumann, Richard K., Jr. (Spring 2003). "Conflicts of interest in Bush v. Gore: Did some justices vote illegally?". The Georgetown Journal of Legal Ethics. ^ Steven Foster, The Judiciary, Civil Liberties and Human Rights, Edinburgh University Press, ISBN 0-7486-2262-4, p. 80. ^ Examining the Vote: the Overview", The New York Times (November 12, 2001). ^ Keating, Dan (November 12, 2001). "Florida Recounts Would Have Favored Bush". The Washington Post. ^ "Just US Law". Justia. Retrieved April 14, 2015. ^ Fessenden, Ford. "Ballots Cast by Blacks and Older Voters Were Tossed in Far Greater Numbers", The New York Times (November 12, 2001). ^ Fessenden, Ford. "How the Consortium of News Organizations Conducted the Ballot Review", The New York Times (November 12, 2001). ^ a b "Bush v. Gore, On Application for Stay" (PDF). ^ a b Raskin, Jamin (March 2001). "Bandits in Black Robes". Washington Monthly. Archived from the original on October 19, 2006. Retrieved October 28, 2006. But in Bush v. Gore, the Rehnquist majority did not even ask, much less explain, how Bush was personally injured by the hypothetical possibility that anonymous third-party citizens might have their ballots counted differently in Florida's presidential election. ^ Fried, Charles. "An Unreasonable Reaction to a Reasonable Decision" in Bush V. Gore: The Question of Legitimacy, page 12 (Yale University Press, Bruce Ackerman ed. 2002): "The outrage against the stay by 673 law professors is, to say the least, overwrought. If the decision on the merits was justified, the stay becomes irrelevant. Yes, it did shut down the counting three and a half days earlier, but by hypothesis that counting was being done in an unconstitutional way." ^ Stone, Geoffrey R. (2001). "Equal Protection? The Supreme Court's Decision in Bush v. Gore". ^ Lund, Nelson. "The Unbearable Rightness of Bush v. Gore". SSRN 267874. ^ The dissent by Justice Stevens in Bush v. Gore stated as follows: "What must underlie petitioners' entire federal assault on the Florida election procedures is an unstated lack of confidence in the impartiality and capacity of the state judges who would make the critical decisions if the vote count were to proceed. Otherwise, their position is wholly without merit. The endorsement of that position by the majority of this Court can only lend credence to the most cynical appraisal of the work of judges throughout the land. It is confidence in the men and women who administer the judicial system that is the true backbone of the rule of law. Time will one day heal the wound to that confidence that will be inflicted by today's decision. One thing, however, is certain. Although we may never know with complete certainty the identity of the winner of this year's Presidential election, the identity of the loser is perfectly clear. It is the Nation's confidence in the judge as an impartial guardian of the rule of law." ^ Glanton, Dahleen (April 27, 2013). "O'Connor questions court's decision to take Bush v. Gore". Chicago Tribune. Vincent Bugliosi. "None Dare Call It Treason". thenation.com. The Nation. Adam Cohen: "Has Bush v. Gore Become the Case That Must Not Be Named? ", Editorial Observer, The New York Times, August 15, 2006.